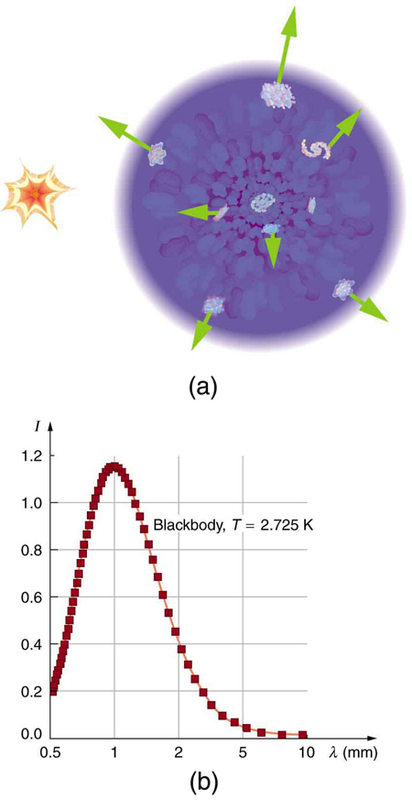 Figure 6(b) shows the spectrum of this microwave radiation that permeates space and is of cosmic origin. It is the most perfect blackbody spectrum known, and the temperature of the fireball remnant is determined from it to be . 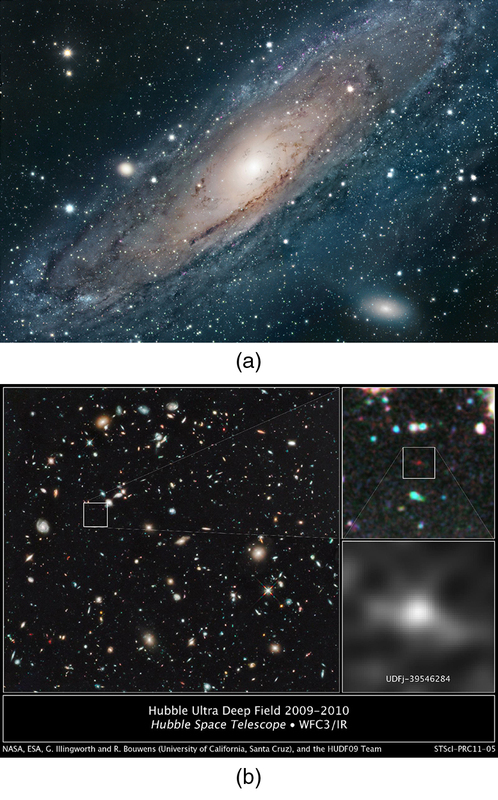 The detection of what is now called the cosmic microwave background (CMBR) was so important (generally considered as important as Hubble’s detection that the galactic red shift is proportional to distance) that virtually every scientist has accepted the expansion of the universe as fact. Penzias and Wilson shared the 1978 Nobel Prize in Physics for their discovery. Names are given to early stages representing key conditions. The stage before back to is called the electroweak epoch, because the electromagnetic and weak forces become identical for energies above about 100 GeV. As discussed earlier, theorists expect that the strong force becomes identical to and thus unified with the electroweak force at energies of about The average particle energy would be this great at after the Big Bang, if there are no surprises in the unknown physics at energies above about 1 TeV. At the immense energy of (corresponding to a temperature of about ), the and carrier particles would be transformed into massless gauge bosons to accomplish the unification. Before back to about , we have Grand Unification in the GUT epoch, in which all forces except gravity are identical. At , the average energy reaches the immense needed to unify gravity with the other forces in TOE, the Theory of Everything. Before that time is the TOE epoch, but we have almost no idea as to the nature of the universe then, since we have no workable theory of quantum gravity. We call the hypothetical unified force superforce. Now let us imagine starting at TOE and moving forward in time to see what type of universe is created from various events along the way. As temperatures and average energies decrease with expansion, the universe reaches the stage where average particle separations are large enough to see differences between the strong and electroweak forces (at about ). After this time, the forces become distinct in almost all interactions—they are no longer unified or symmetric. This transition from GUT to electroweak is an example of spontaneous symmetry breaking, in which conditions spontaneously evolved to a point where the forces were no longer unified, breaking that symmetry. This is analogous to a phase transition in the universe, and a clever proposal by American physicist Alan Guth in the early 1980s ties it to the smoothness of the CMBR. Guth proposed that spontaneous symmetry breaking (like a phase transition during cooling of normal matter) released an immense amount of energy that caused the universe to expand extremely rapidly for the brief time from to about . This expansion may have been by an incredible factor of or more in the size of the universe and is thus called the inflationary scenario. 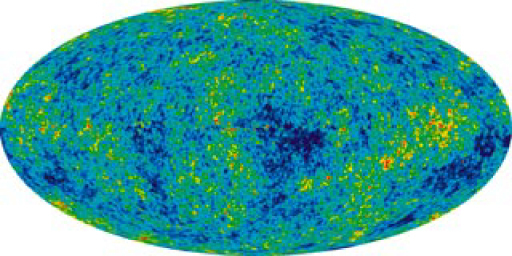 One result of this inflation is that it would stretch the wrinkles in the universe nearly flat, leaving an extremely smooth CMBR. While speculative, there is as yet no other plausible explanation for the smoothness of the CMBR. Unless the CMBR is not really cosmic but local in origin, the distances between regions of similar temperatures are too great for any coordination to have caused them, since any coordination mechanism must travel at the speed of light. Again, particle physics and cosmology are intimately entwined. There is little hope that we may be able to test the inflationary scenario directly, since it occurs at energies near , vastly greater than the limits of modern accelerators. But the idea is so attractive that it is incorporated into most cosmological theories. 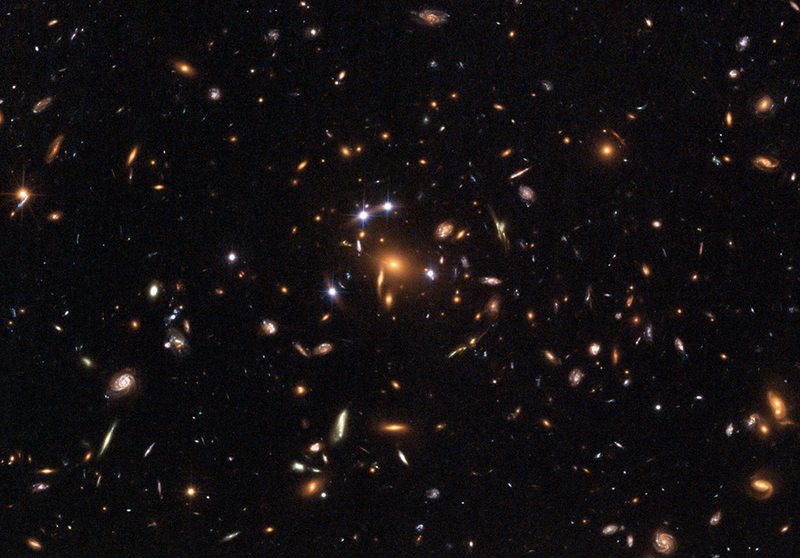 3: (a) Estimate the mass of the luminous matter in the known universe, given there are galaxies, each containing stars of average mass 1.5 times that of our Sun. (b) How many protons (the most abundant nuclide) are there in this mass? (c) Estimate the total number of particles in the observable universe by multiplying the answer to (b) by two, since there is an electron for each proton, and then by , since there are far more particles (such as photons and neutrinos) in space than in luminous matter. 7: (a) What is the approximate speed relative to us of a galaxy near the edge of the known universe, some 10 Gly away? (b) What fraction of the speed of light is this? 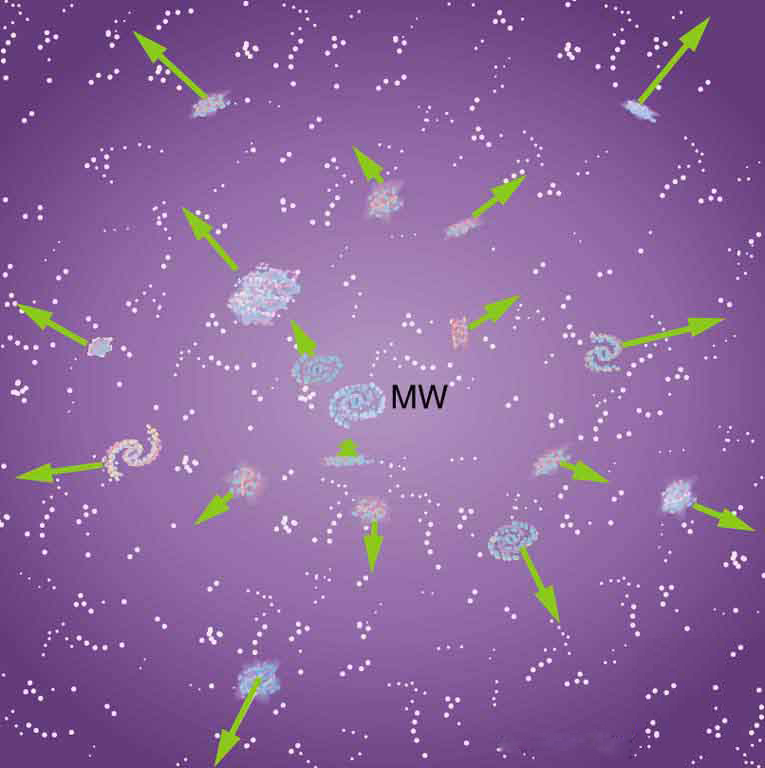 Note that we have observed galaxies moving away from us at greater than . 8: (a) Calculate the approximate age of the universe from the average value of the Hubble constant, . To do this, calculate the time it would take to travel 1 Mly at a constant expansion rate of 20 km/s. 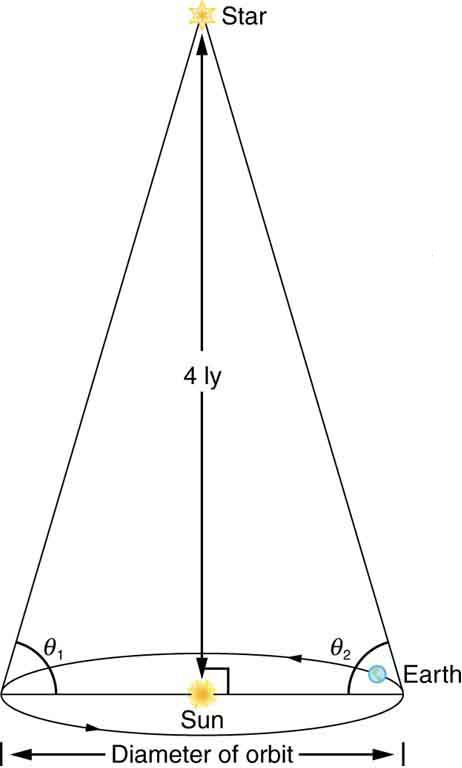 (b) If deceleration is taken into account, would the actual age of the universe be greater or less than that found here? Explain. 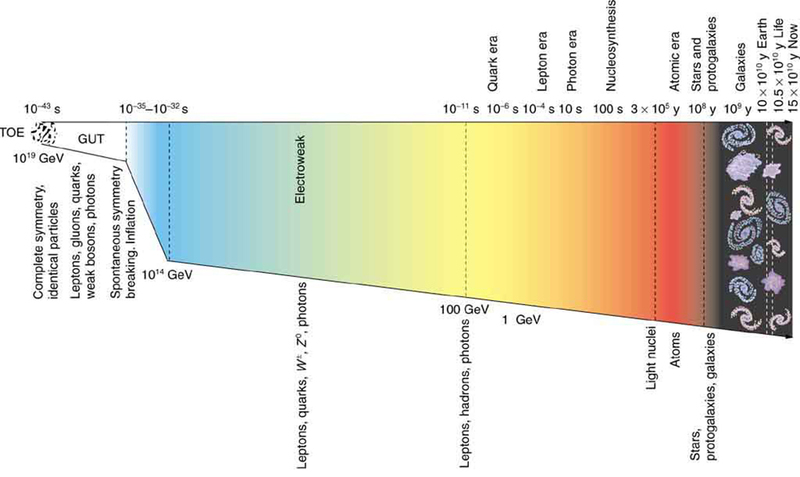 13: The average particle energy needed to observe unification of forces is estimated to be . (a) What is the rest mass in kilograms of a particle that has a rest mass of ? (b) How many times the mass of a hydrogen atom is this? 20: (a) Use the Heisenberg uncertainty principle to calculate the uncertainty in energy for a corresponding time interval of . 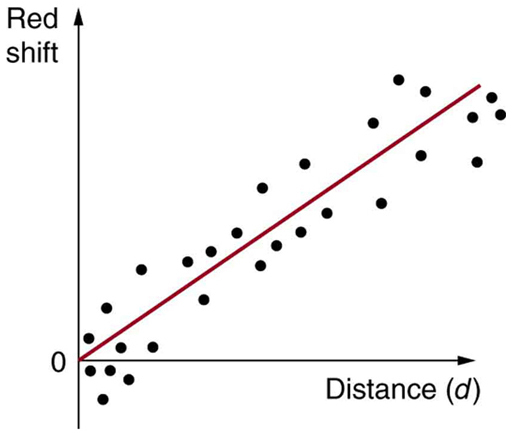 (b) Compare this energy with the unification-of-forces energy and discuss why they are similar.